Try this recipe. Makes for some really great muffins. In a large bowl combine the flour, sugar, baking powder and salt. In a small bowl beat the egg, milk and oil. Pour into the dry ingredients and stir just until moistened. Half a cup of chocolate chips are to be stirred in at the end. 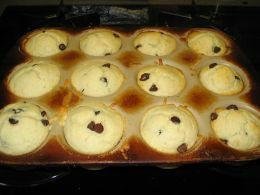 Fill greased or paper-lined muffin cups three-fourths full and bake 18-20 minutes. This makes one dozen muffins.